We’re very proud of the authority and accuracy of this long article, but please be sure to let us know of any updates, corrections or additions you might have. Thanks… and enjoy! Up Against the Wall! 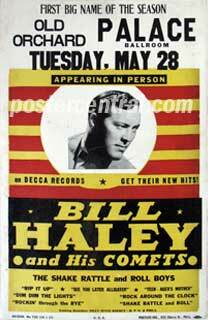 Goldmine magazine presents a Special Report: Collecting Rare Posters, The Fastest Growing Hobby in Music. 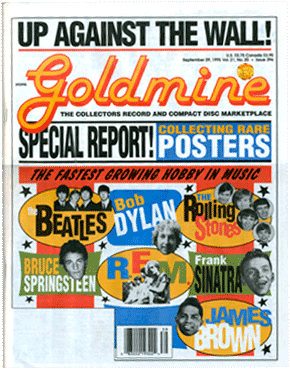 Goldmine Issue #396, Vol. 21, No. 20, dated September 29, 1995. Article written by Pete Howard, and edited by Jeff Tamarkin with assistance from Bonni Miller. 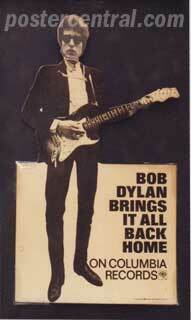 And “Bob Dylan Brings It All Back Home on Columbia Records,” a small cardboard promotional stand-up made to promote Dylan’s then-new album Bringing It All Back Home, released in March 1965.